"Red Dragon" delights in contrasting operatic refinement with bloody savagery. The opening scene capsules this motif, when after a nearly perfect symphonic performance, the proper gentleman, Hannibal Lecter (Hopkins), enjoys the flute player - culinarily speaking. Apparently the musician tastes better than he sounds. Brilliant and seemingly altruistic, Hannibal assists Special Agent Graham (Norton) in troubleshooting tough serial killer cases. But the team effort comes to a screaming halt when Graham connects some dots that Hannibal's missed, "You're the best forensic psychologist I know, I'm surprised you didn't think of it." Hannibal smiles, concedes his imperfection, but Graham's epiphany cuts an unsightly gash in their friendship and lands Hannibal behind bars, bricks & mortar. Careful powerful direction, excellent production value, solid juicy acting, an interesting tale, elegant crisp dialogue, and stalwart scoring make "Red Dragon" gripping commanding and otherwise domineering. Hopkins is convincingly ominous, and Norton, once you get over his boyishness, believably concerned, intelligent, gifted and ultimately vulnerable. The two eventually team up again, albeit, separated by bulletproof glass, in a dangerous game of bargain & barter to crack a new twisted string of family slayings. The gory graphics are kept to a minimum as not to dampen the real beating heart of the picture -- the perilously flirtatious interplay of intimidation and negotiation. Norton is the real star, Hopkins' contributions tastefully sparing, thoroughly potent. Hannibal: "You think you're smarter than me." Hannibal: "Oh? And what would they be?" I'm not even fond of this genre, but I wanted more ... and then, I nearly got more than I could bear. The film's only faults lie in a subtle momentary dip into cliché at a crucial time (but that may just be because I see too many movies) and a menacing disturbing aftertaste (but that's its intent -- right?). "He won't stop because it makes him god ... would YOU give that up?" 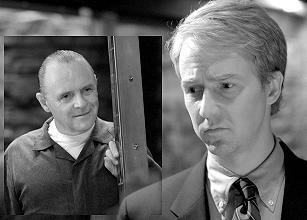 Interesting Notes: "What's so fascinating about Lecter," Hopkins says, "is that he is the dark side of every human being. [He] makes people face up to their lies and their shadows and the dark sides of themselves." Though skeptical, Hopkins signed on to "Red Dragon" after learning Tally was writing the script. Tally says of Hannibal, "It's a real challenge to write a character who is smarter than you and he is much smarter than I am." Red Dragon. Copyright © 2002. Rated R.
Starring Anthony Hopkins, Edward Norton, Ralph Fiennes, Harvey Keitel, Emily Watson, Mary-Louise Parker, Philip Seymour Hoffman. Based on the Book by Thomas Harris. Produced by Dino & Martha De Laurentiis at Univseral/MGM.